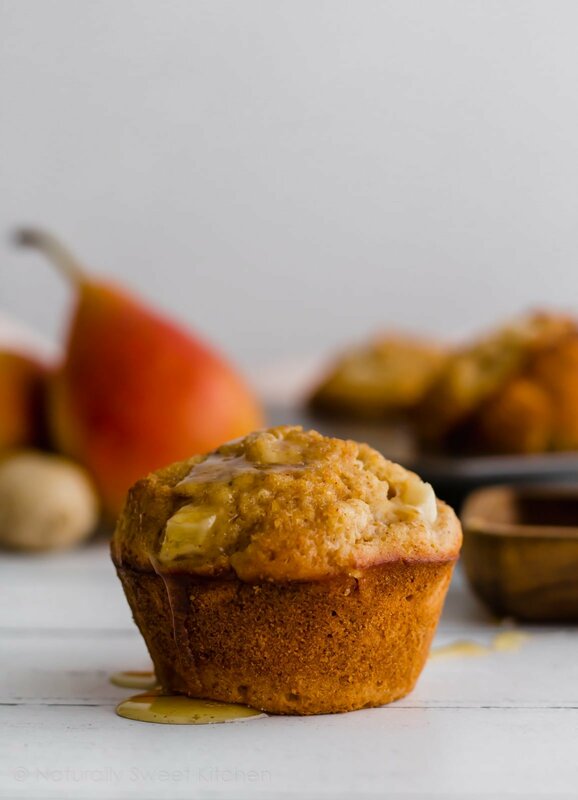 These hearty ginger pear muffins are great for breakfast on-the-go – not too sweet with the right amount of spice and bursting with fresh fruit. Happy Monday, friends! 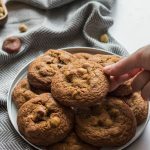 I’m so excited to share this recipe with you today and to chat about all things Ginger Pear Muffins. Who else is a massive fan of the muffin? Before I knew they were basically a cake disguised as a breakfast food, I used to eat muffins all. the. time. I would grab one between classes at uni (to accompany my fifth giant triple-shot latte), I’d buy one as a snack on Saturday during my work lunch break, and sometimes I’d get one on the way home from a late shift. I thought I was being healthy. I mean, if it had blueberries or carrots in it and I could eat it for breakfast, then it must be good for me, right? It was a sad day that I discovered this wasn’t entirely true. When I found out that my favourite carrot muffin from a local bakery was actually packing 18 grams of fat and a not-so-nice 21 grams of sugar, I went off them a bit. But that didn’t stop me from craving them. There were days, weeks even, where I would dream about biting into the soft, fluffy, sugary morsels of breakfast goodness. When you start to dream about something, you realise you might have a problem. I obviously couldn’t give up muffins cold-turkey, so I set about trying to make healthier versions of my favourite on-the-go breakfast. The first few batches turned out horribly. We’re talking chewing-on-cardboard horrible. But after many failed attempts, I nailed the recipe for whole wheat, honey-sweetened carrot muffins. Warmed up and topped with a little peanut butter, they were protein-packed, low in sugar, and offered a healthy dose of fibre. I got through many a late-night study session with those muffins by my side. 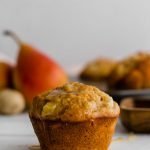 I spent a lot of time (and ingredients) perfecting refined sugar free muffins in my uni days, and today I’m sharing with you one of my favourites – Ginger Pear Muffins. These muffins aren’t super sweet and are a perfect breakfast treat for the colder weather. The ginger warms you from the inside out, and the sweet, ripe pear lends extra moisture so the muffins never taste dry or tough. The raw sugar topping is optional, but I highly recommend it as it adds a little crunch, just like your favourite bakery shop muffin. Next week we’ll be diving into Christmas baking full tilt, so enjoy this last reprieve and prepare yourself for an onslaught of fairy lights, cranberries, chocolate, and peppermint. It’s going to be so fun! 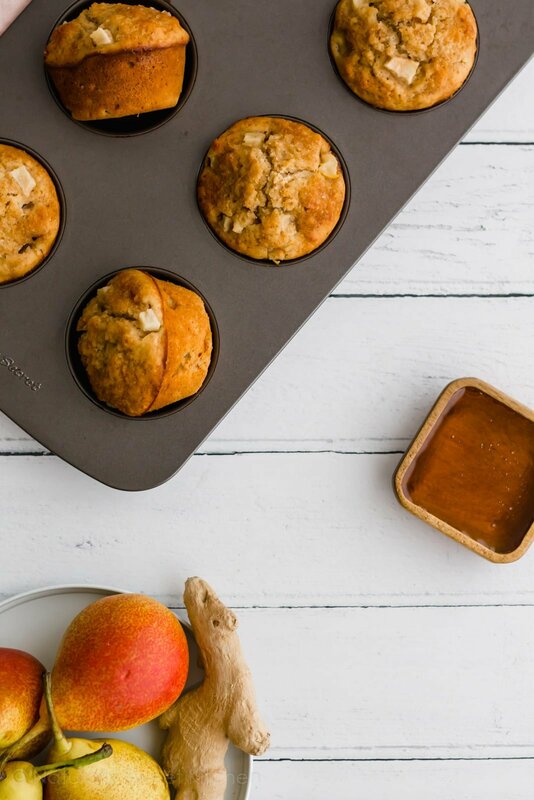 I hope your breakfast tomorrow is a warm Ginger Pear Muffin. 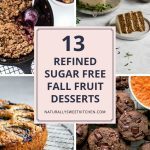 If you make them, don’t forget to take a photo and tag me on Instagram @naturallysweet_kitchen and use the hashtag #naturallysweetkitchen, so I can share your images. It makes my day to see these bakes come to life in your kitchen. Preheat the oven to 220°C (425°F) and grease a regular muffin tin. Whisk together the flours, baking powder, spices, and salt in medium bowl until well combined. Set aside. 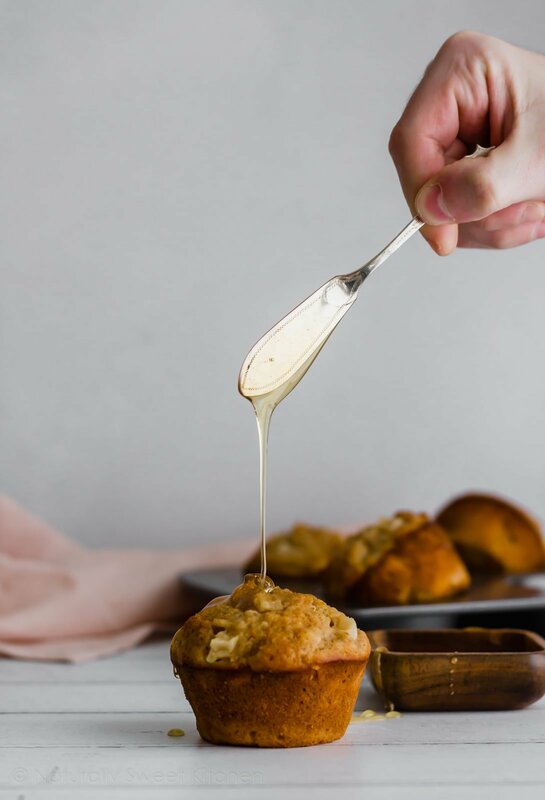 In a large bowl, combine the honey, oil, vanilla, and egg and whisk well. Whisk in the grated ginger and orange zest and then slowly pour in the milk while constantly stirring. Add the dry ingredients to the wet ingredients and fold together just until the flour begins to disappear. Some pockets of flour are fine; do not overmix this batter. Gently fold in the pears, taking care not to overmix. Fill your muffin tin cups to the top with the batter. Sprinkle a little bit of raw sugar on the top of each muffin cup for extra crunch. Bake the muffins for 5 minutes at 220°C (425°F), then reduce the temperature to 180°C (350°F) and bake for a further 10-12 minutes. Once the muffins have risen and a toothpick inserted in the centre comes out clean, remove the tin from the oven and place on a wire rack to cool for 10 minutes. Remove the muffins from the tin and allow to cool to room temperature. These muffins will keep sealed in an airtight container at room temperature for up to 4 days. These muffins can be frozen for up to 3 months. Defrost in the refrigerator.